Balearic Islands: The islands have been inhabited since prehistoric times, around 5000 BC, and there are many Cyclopean remains. These show the communities constructed dwellings of stone. There is evidence of primitive agriculture including the keeping of domesticated animals. Jewellery, pottery and tools appear to have been manufactured. Later they were frequently visited by Phoenician traders. 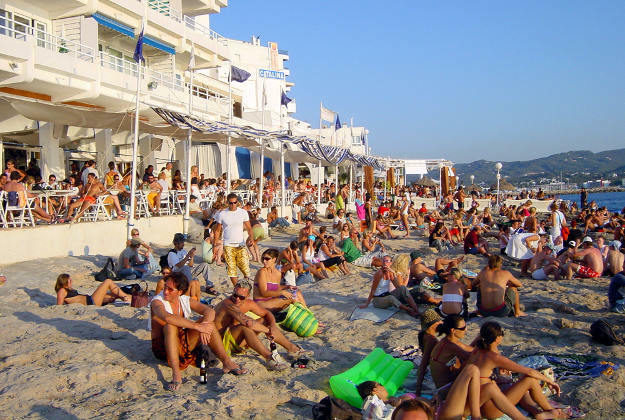 In 654 BC the Carthaginians founded what is today Ibiza city. Roman occupation followed and they were in turn evicted by the Visigoths. The Moors invaded the islands during the 8th century and there is still evidence of their 300 year occupation to be found in the islands architecture and the customs of the islanders themselves. Christians reconquered the islands during the 13th century. Mallorca falling first in 1229, followed by Ibiza six years later. Menorca was the last to fall in 1287. Initially the islands flourished as Catalan colonies but famines and raids by pirates encouraged by isolation from the mainland saw the Balearic Islands decline. Mallorca and Ibiza were occupied by the Bourbons following the conclusion of the Spanish War of Succession in 1715. 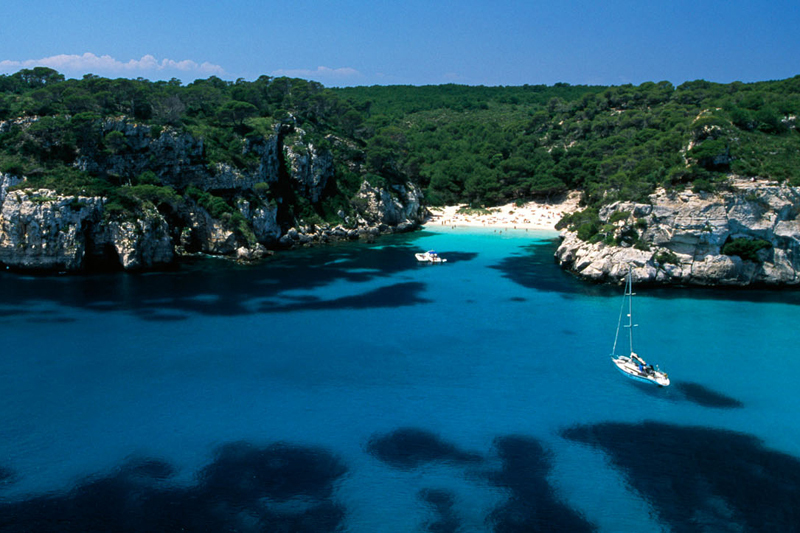 Menorca however was ceded to the British under the treaty of Utrecht along with Gibraltar on the Spanish mainland. British rule over Menorca continued until 1802. In the Spanish Civil War, 1936-39, Mallorca and Ibiza were soon under the control of Franco's forces enabling the Italian fleet to use Mallorca as it's base and offer support to the insurgents. Minorca remained Loyalist until 1939. The 1950's saw the first charter flights land in the islands bringing the tourists that have in turn bought prosperity to the islands and their peoples involved in this lucrative trade. After tourism agriculture and fishing make significant contributions to the economy of the islands. Fruit, olive oil, wine, majolica ware and silver filigree are exported in quantity. 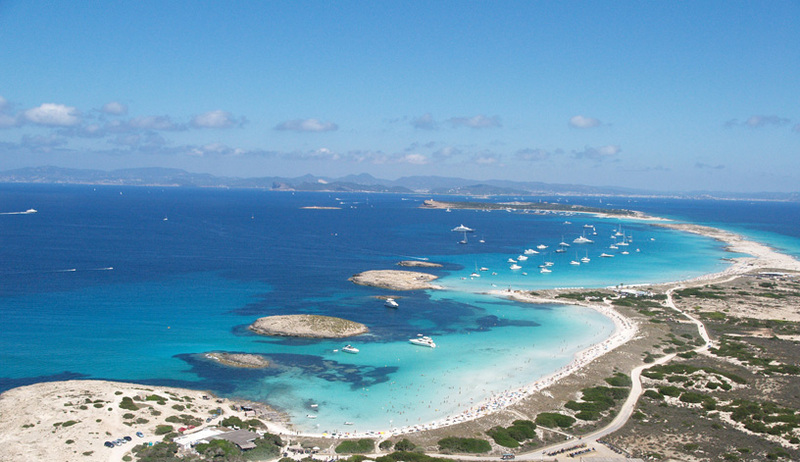 Formentera is the smallest of the four islands. A ferry service runs from Ibiza to the island's port La Savina, the journey takes between 25 and 50 minutes. It is also expensive as is eating out. The island itself is attractive and has good beaches with powder white sand and clear blue waters. There are plenty of opportunities for hiking and walking. 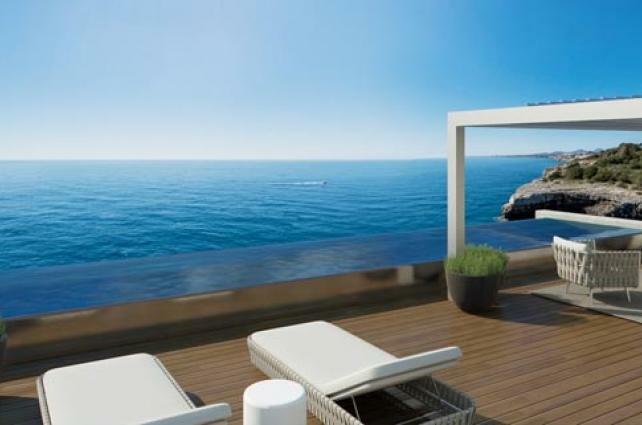 Ibiza, covering 572 sq. km, is the third largest of the islands. 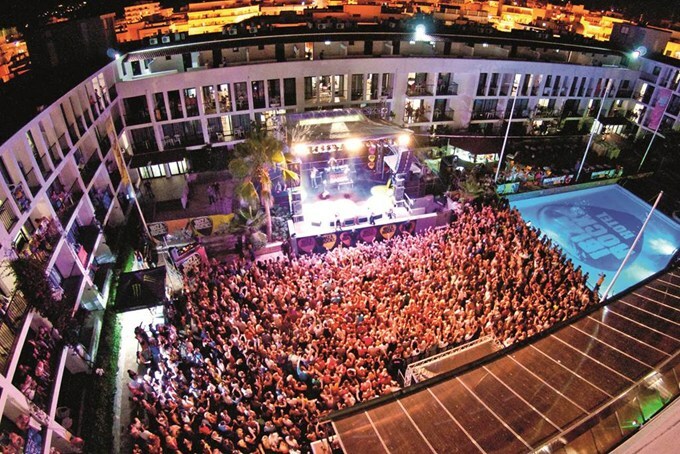 The capital is Ibiza city, renowned for it's extravagant night life. This attracts large numbers of tourists, over one million now visit every year. Some of Spain's most famous clubs are to be found hear along with plethora of bars, cafes and restaurants. The Dalt Vila, a souk-like walled city, is a UNESCO World Heritage Site. There are plenty of beaches but in the summer months these get very crowded. Cala Mastella on the east coat and Beniras on the west are two of the best. The north of the island is popular with cyclists and hikers. Inland the landscape is rocky and pine trees grow in abundance. Fishing and salt works contribute to the economy with some subsistence farming, aided by irrigation. Little rain falls and the predominant crops are almonds, figs and olives. 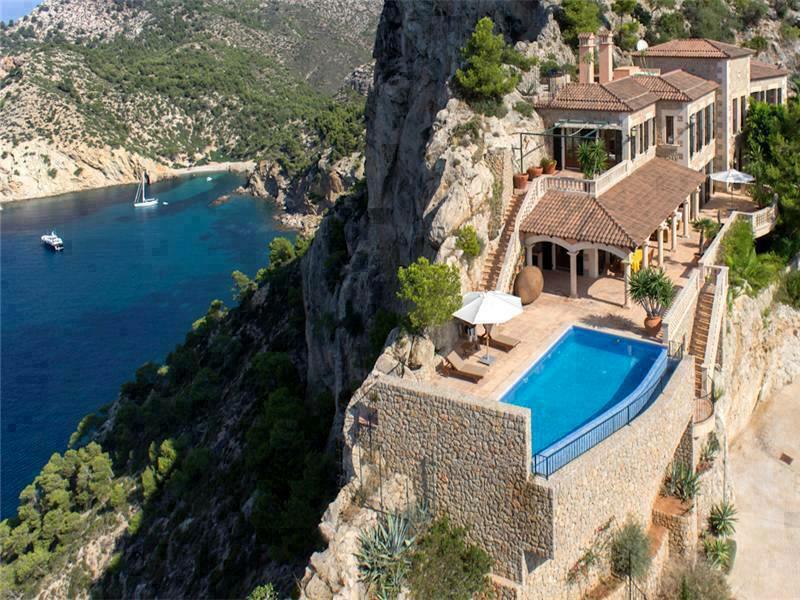 Mallorca is the largest of the Balearic Islands and covers over 3,500 sq. km. Prior to 1276 Mallorca's history was the same as the other islands. But then the kingdom of Mallorca was formed and included the island along with some areas of both mainland Spain and France. Perpignan, in Roussillon, France was the capital of the kingdom. It was returned to the crown of Aragon in 1343 and flourished until the discovery of the Americas and the subsequent change in major trade routes. 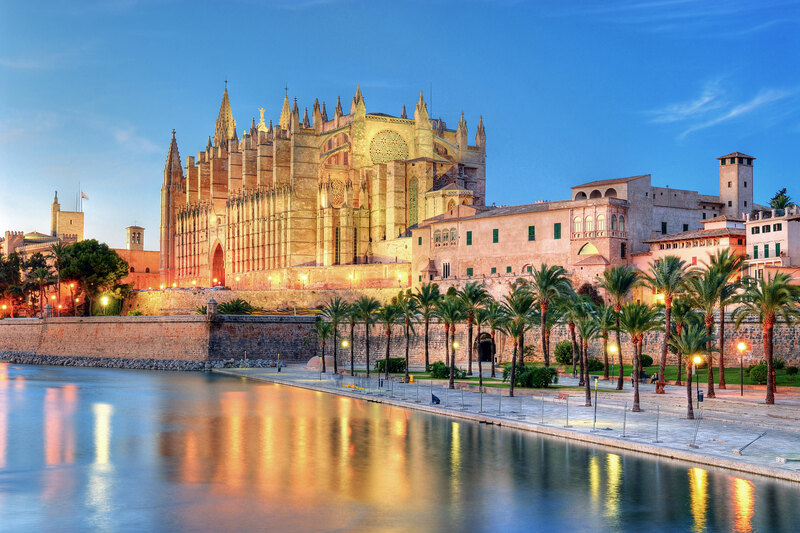 Palma de Mallorca, on the south coast and renowned for it's spectacular sunsets, is the capital city. La Seu is the city's enormous cathedral. Built on the site of a former mosque, construction commenced in 1230. It was completed some 370 years later in 1600. Anybody, today, who has tried to hurry a Spanish builder will be undismayed at what to others must look like an eternity in time. The city also has museums, Renaissance mansions a plenty in the old town and many attractive churches. 1950 saw the first charter flight land here and today the island plays host to nine million visitors annually enjoying the mild climate and attractive scenery. 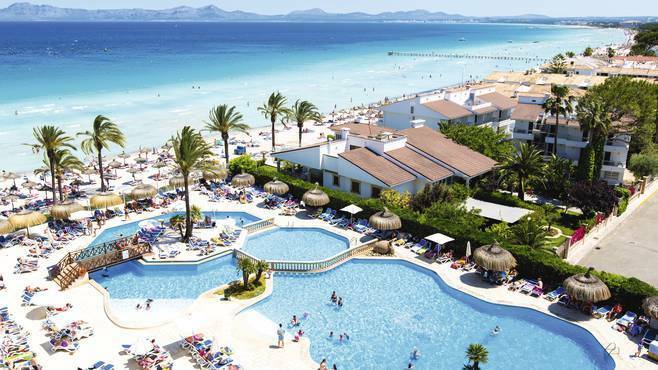 Most come for the obvious three S's - Sun, Sea and Sand but the island has much more to offer. 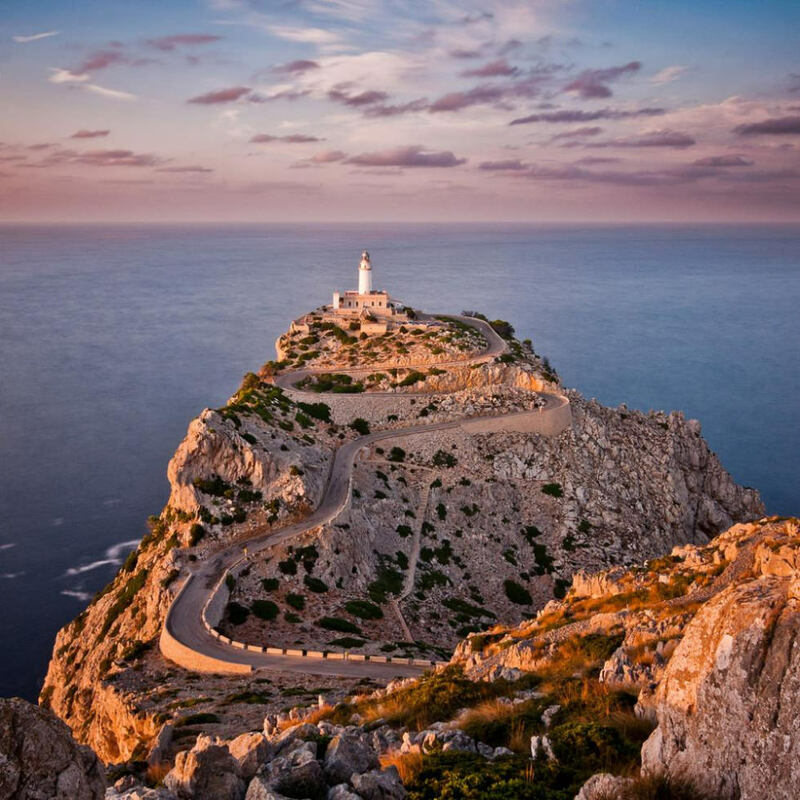 The Serra de Tramuntana mountains, rising to nearly 1500m, dominate the northwest of the island. 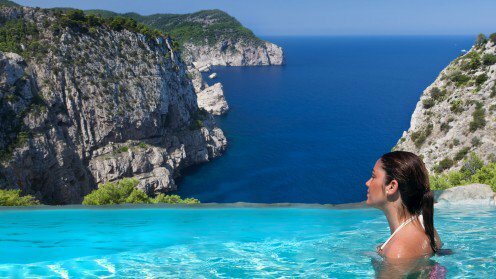 The combination of a rugged, rocky coastline, pine forests, olive groves and small, charming villages, Deia in particular, perched high above the Mediterranean, make this part of the island quite beautiful. Walking is popular with spring being the best time, the summer months can be very hot. 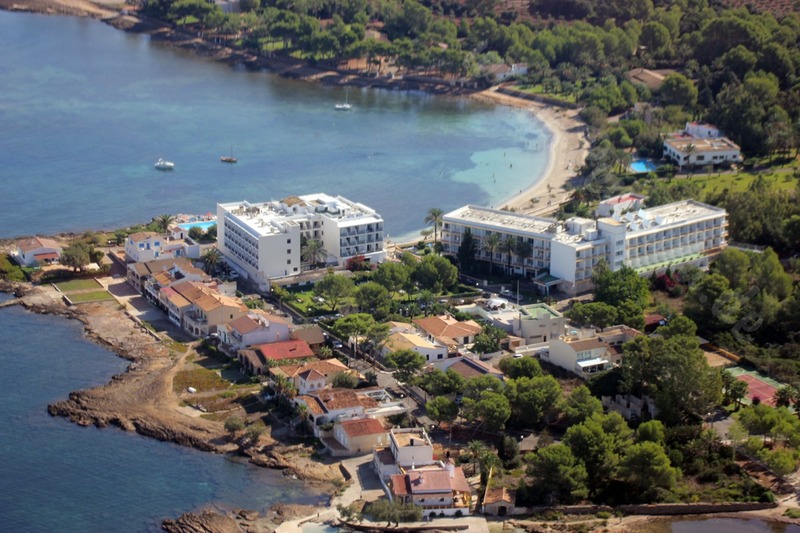 Two bays dominate the north east coast, the Badia de Pollenca and the Badia d'Alcudia. An almost continuous string of sandy bays and beaches make up the eastern coast and unsuprisingly this area has seen intense development. The southern coast, by contrast, is in the main rocky cliffs plunging into the Mediterranean. Port d'Andratx, on the south west coast, is a small attractive town built on low hills all around a narrow bay. The island is also known for it's stalagmite caves and architectural treasures and prehistoric monuments. A further landmark is the abandoned old monastery where both Chopin and George Sand lived. The interior is dominated by Es Pla, a large fertile plain, cereals, flax, grapes, and olives are grown. Pigs and sheep are raised. There is also limited mining of copper and lead and quarrying of marble. 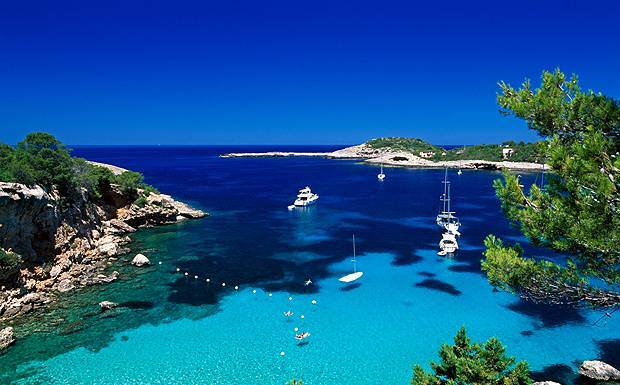 Covering 702 km, the island of Minorca is the second largest of the Balearic Islands. In 1708 during War of the Spanish Succession it was occupied by the British. France seized it during the Seven Years War but in 1763 the Treaty of Paris returned it to British rule. In 1782, during the American Revolution, the French allied with Spain seized the island but sixteen years later the British returned once again. The final chapter came in 1802 when the Peace of Amiens awarded Minorca to Spain. But even today there is still strong evidence of British occupation. Architecture has a distinctive Georgian feel even down to the sash windows. Today Port Mahon, lying at on the east coast, is the capital and the island's major port. The harbour is both deep and sheltered and overlooked by the town built on the cliffs at the southern end. British influence can be seen at both Fort Marlborough and Collingwood House, named after the Admiral who served alongside Nelson. If any further evidence of the British past is required a visit to the Xoriguer Gin Distillery should provide it. In contrast to the other two main islands Menorca remains seemingly tranquil. There is little intensive development and it is still possible, even in the middle of summer, to find beaches almost deserted. 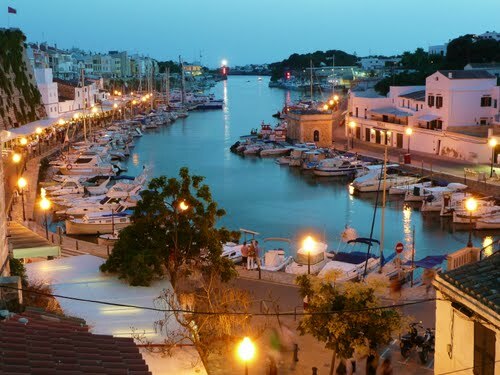 Ciutadella, on the western side of the island, is a charming little town boasting fine mansions. There is much evidence of Menorca's prehistoric past and a great number of megalithic monuments exist. There are many sites and they fall into three different time periods. The Pre-Talayotic Period or Cave Era from 2000 - 1300BC, the Talayotic Period or Bronze age, 1300 - 800BC and the Post Talayotic Period or Iron Age, 800 - 100BC. The centre is hilly but the island as a whole in mainly lowland. Despite the fact Menorca's rainfall is greater than the other islands irrigation is still required. Cereals, flax, wine and olive oil are the main agricultural products. There is a little light industry.